Charcoal and wood are two of the most widely used materials for accelerator mass spectrometry (AMS) radiocarbon dating. AMS labs prefer to carbon date charcoal and wood because these materials do not need complex pretreatment. Willard Libby, the pioneer of radiocarbon dating, identified charcoal to be the most reliable material to carbon date. The time-width of an organism refers to its total growth and exchange period with the biosphere. The time-width affects the way radiocarbon age is converted into calendar age for a sample. A wood’s time-width depends on the number of tree rings taken for radiocarbon dating. Fragments of charcoal, however, may have a time width that can’t be quantified. One of the main assumptions of radiocarbon dating is that the organism’s time of death is also the time it ceased carbon exchange with the biosphere. If this is not the case, such as in wood, the radiocarbon age of the organism at death is not zero. When radiocarbon dating a piece of wood or charcoal, the event dated is the growth of the tree ring. Trees grow by the addition of rings, and these rings stop exchanging carbon with the biosphere once they are laid down. Thus, the radiocarbon age of a single tree’s heartwood and sapwood will not be the same with the innermost heartwood being significantly older than the sapwood. Any charcoal or wood sample that is carbon dated will have an apparent age, which may result in errors of up to hundreds of years unless short-lived tree species or twigs are selected for radiocarbon dating. A sample’s radiocarbon age can tell us when the organism was alive and not when the material from that organism was used. The “old wood” problem must be taken into account to avoid wrong conclusions when linking artifacts to event and context. Delayed use and reuse are processes that also contribute to the “old wood” problem. Charcoal or wood could have been seasoned prior to the actual use of the timber that provided the sample that has been radiocarbon dated. 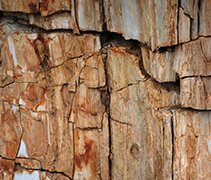 Hardwoods that are very resilient against decay could have been reused in other structures in later years. The effects of these depositional processes may not be quantifiable but should not be overlooked because the carbon 14 dating results might turn out to be too old for the context being dated.